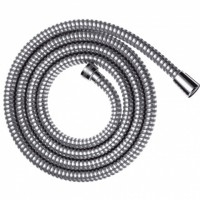 If you opt for a Hansgrohe Metaflex shower hose, you opt for a classic plastic shower hose with spiral wrapping. Hansgrohe Metaflex shower hose is available in different lengths, so that you surely will find the right shower hose for your shower set. Each Hansgrohe Metaflex shower hose is particularly easy to clean and bend-protected so you will be able to enjoy your Hansgrohe shower hose for a very long time.